On 29 March 1516, the Venetian Senate approved a law that ordered all the Jews in the city to reside in la Corte de Case, a part of Venice surrounded by high walls, whose doors were constantly guarded. Thus, the Venetian ghetto was born. While the Jews could freely leave the ghetto during the day, they had to return to their homes, and remain there, at night. Only doctors, and a few others with a special permit, could leave after dark. The Jews were indispensable to the economy of Venice, then a small but powerful state that relied on maritime commerce. At first, the Jews, who paid very high taxes to be able to reside in the city, ran pawnshops. The conditions of the loans were decided by the Venetian government, but, despite this, the business was very lucrative in the beginning. Later on, they were also allowed to become merchants. This, together with the religious freedom they enjoyed in Venice, attracted there many Jews who were persecuted in their own countries. Being able to practice their religion freely was one of the few rights (citizenship wasn’t one of them) the Jews enjoyed in Venice. This also meant that the government would protect them from the Inquisition. Several Jews were tried, but it was those who pretended to have converted to Catholicism but still practiced Judaism in private, or that were baptized several times, that were severely punished. Venice was full of marranos (Jews who had converted to Christianity to escape persecution), so it wasn’t always easy to determine what beliefs some of the accused had. The trials in Venice were scrupulous and fair and only 18 people were condemned to death. More, though, were condemned to other types of punishment, like Giuseppe Francoso who, found guilty of having been baptized several times, was sentenced to “forced labor in the galleys” for twenty years, and exile thereafter. Harsh surely, but compared to other cities, where the death penalty was used more often, Venice was lenient. The relationship between Venice and its Jews changed with the economic situation. When Venice prospered, the Jews, who with their hard work and taxes contributed to its success, were granted more liberties and left in peace. But as soon as the economy took a turn for the worse, they were used as scapegoats. Their freedoms were curtailed and they were often threatened of being kicked out. They were usually allowed to remain, though, by agreeing to paying higher taxes. For centuries, these high taxes and restrictions on the professions Jews were allowed to practice, weren’t too big a problem. Pawnshops and commerce were lucrative activities that allowed the Jews to prosper. But in the eighteenth century, when Venice lost its maritime supremacy and the economy declined, they weren’t able to pay such exorbitant amounts of money anymore. Now, they were the ones who needed help. The Jews were eventually freed by Napoleon. His troops conquered the city and, on 7 July 1797, the ghetto was abolished. Now they could freely live among the Venetians. 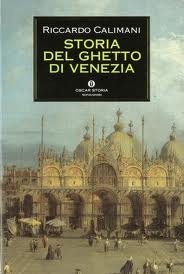 But the history told in The Venetian Ghetto doesn’t end there. Riccardo Calimani also briefly mentions what happened to the Jews from their liberation to modern times. In addition, the book also describes the religious ceremonies of the Jews, their buildings and monuments, and their daily habits. The author also shares the stories of some of the Venetian Jews. Some were ordinary citizens whose trace remains in trial papers or business documents. Others were famous personalities of their time, such as the poetess Sarah Coppio Sullam and the rabbi Mosé Chaim Luzzatto. To me, these stories were the most interesting part of the book, as they help the reader relate to the bigger, but general, story of the Venetian Jews, breathing life into it. If I had to be honest, I expected the book to be somewhat dull and dry, but it wasn’t at all. A couple of chapters may have drawn on a bit longer than necessary, but overall the book is well-written and well-paced, making it flow easily. It is also well-researched and very detailed, but not so much as to overwhelm the reader. This book is a joy to read. If you’re interested in the topic, I highly recommend it. The Venetian Ghetto by Riccardo Calimani tells the story of the ghetto of Venice, from its creation in 1516 to its abolition in 1797, plus a brief summary of what happened to the Venetian Jewish community afterwards. The book discusses the customs, daily habits and religious ceremonies of the Jews, and shares the stories of some the inhabitants of the ghetto. Well-researched, well-written, and detailed, the book flows easily and is never dry nor boring (although a couple of chapters are a bit longer than necessary).